looking for our 1950s retro glass christmas tree ornaments? decorate your christmas tree with modern ornaments in glass. 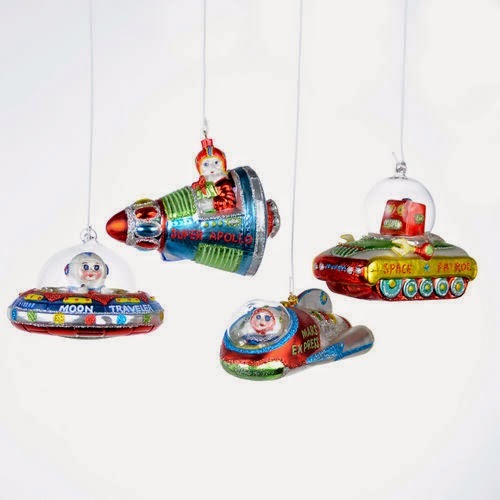 space shuttles and apollo modules head to the stars and so do these space age ornaments. our beautiful mid-century modern 'space age' tree ornaments are simply irresistible and reflect the space-age optimism of the 1950s. this set of 4 uniquely modern tree ornaments recall the 1950s space exploration period. this set includes the following ornaments: super apollo rocket (1), space patrol rover with robot (1), ufo moon traveler saucer (1) and mars express space traveler (1). all ornaments are highly detailed and are made in beautiful colors. intricately detailed for plenty of personality, each tree ornament is truly one of a kind. our beautiful ornaments are expertly crafted from mouth-blown glass, then hand painted and given a glittery finish. this out of this world tree ornament set will be expertly packaged to ensure safe (intergalactic) travels. this space age ornament will not only be the most beautiful and unique on your tree this season, it also makes for a great gift. price is for the set of 4 (four) ornaments as pictured.